SNES Super Metroid: MockingBird Station (JPN/USA) in 31:00.42 by Hoandjzj. 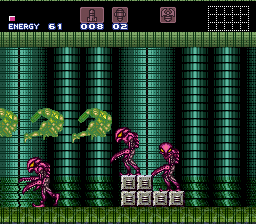 Super Metroid MockingBird Station is a Super Metroid hack by Xaggoth. Samus has been hired to investigate MockingBird Station. Others have come before her, but none of them have returned. Upon arrival, the station sealed the hangar's doors, blocking her way out. After scanning her systems, Samus finds that she must disable the station's power generator before she can leave. Unfortunately, the most direct route to the generator has been blocked and she must take a more roundabout path. The only thing that she knows is that much of the station is in lock down and she will need to release bulkheads to open more of the station. A larger bulkhead in engineering is blocking the alternate route. Disabling the generator will destroy the station, but there is no other option. Hoandjzj decided to run this game collecting the least amount of items possible, when the hack itself forces the player to collect them. Don't expect to see Mother Brain in this video, since it isn't in this hack. The in-game completion time is 00:19. To play the snes9x movie file, you will need the IPS patch for this hack. You can get it here. You will also need to apply this patch to an unheadered version of the ROM; if your ROM has a header, tools such as SNES Tool can be used to remove it.